It’s our own fault. Most of us had traveled to Cleveland for Choice One’s biennial company trip. We guess Dane owed us out of spite—as a huge Cleveland Browns and Indians fan, he was just a little bummed that he was not able to join us for a ton of fun* in one of his favorite cities. Don’t worry Dane, we promise we didn’t go through ANY roundabouts in Cleveland without you. Plus, your accidental purchase marks our first Dayton-region “Best Places to Work” win. 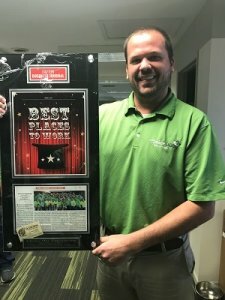 So since you’ve created a constant reminder that we’re a “Best Place to Work,” we should probably believe in second chances. Especially if your second chance makes us laugh as much as the first one! *For the record, Dane was having fun too: he and his wife Heather had just welcomed daughter Tatum into the Choice One family!